Once again, it is time to say goodbye to a bookstore, and if one of the “big guys” had to go away, I am sorry that it is Borders. Their store in Athens, Georgia, was one of my favorites. The customer service was always good, and the store was in a great location. As I have noted in previous posts, the new way to read is the ebook. I am actually surprised that it took this long for the ebook to finally fulfill its destiny. Previous readers, including the Rocket eReader, the similar EBookman, and the Palm, were all were capable of displaying a variety of books, but the new generation of reading devices, including the Nook, the Kindle, and the multipurpose iPad have made reading ebooks so convenient that even beautiful stores with good coffee, friendly faces, and ample parking are not going to be enough to keep them in business. A decade ago, I first learned about the problems with print publishing from long-time literary agent Richard Curtis. As a first-time attendee at the Harriet Austin Writer’s Conference in Athens, I was in a bit of awe as Curtis described the vast number of books which are printed but never sold. Some of these are recycled into pulp after sitting in a warehouse, but many of them go out to stores then come back in as “remainders.” There are other models for selling books, including print-on-demand, but the larger houses do waste a lot of paper and ink. Bookstores, by and large, do not pay for the books on their shelves, but those volumes are on “loan” from large publishers. When customers buy the books, a part of the money goes to the store, part goes to the publisher, and a wee bit goes to the author. If a customer browses in the store, then buys the book for his eReading device (whichever one) then the publisher gets more money than with print, unless the book price is substantially less. And, depending on the price paid, the author gets a wee bit or a wee bit more. Either way, the physical store gets zip. While I am sure some customers were still buying printed books, and maybe a coffee or a gift, there just were not enough of them to keep the Borders chain afloat. 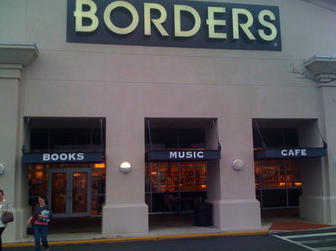 Business people who are writing about the situation mention that Borders, which was selling CDs and DVDs just a few years ago, was slow to realize that video and music were moving to online delivery. Now, books take their place alongside film and music. There will still be some good independent bookstores, I hope, and Barnes and Noble has its Nook and Fictionwise eBookstore, so it may survive the downward trend in print sales. I suspect the next casualty will be Books a Million. While I will certainly miss Borders, I did not buy much there. I guess that makes me one of the many reasons that it went bankrupt. So, I will be buying the next novel I read for the iPad. Just like the last few that I read. Coming soon— a review of a SF series by Thomas DePrima. 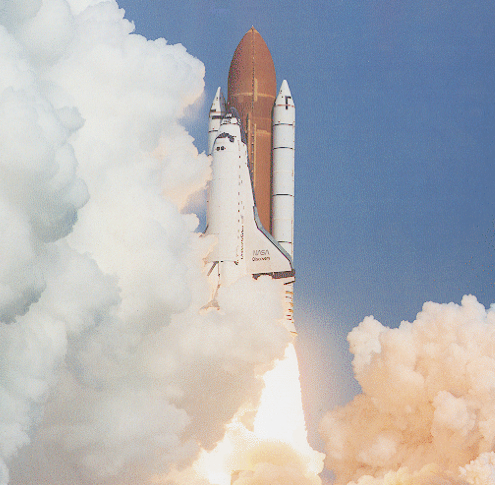 The last space shuttle launch occurred last week. Although NASA claims to be working on a new vehicle, it is years (or decades) away from launching, if it does launch at all. Having grown up during the space program’s heyday, I see this as just another symptom of America’s declining health. A Democrat president declared that America would not be left behind in the conquest of space, and through administrations led by both parties, NASA put men and satellites into orbit, then sent men and machines to the moon. There are many more, some of which my spotty understanding of science does not let me fully understand, but suffice it to say that even social program loving critics of NASA probably enjoy talking on cellular phones, watching satellite television on LCD screens, and finding their way with gps navigation. If this program has been so valuable to our nation, why is it in decline? Perhaps, because the government caters to the selfish. Critics of NASA tend to say something like, “Let’s solve our problems here, before we go into space.” So, the United States government has put more and more dollars into the hands of the so-called poor, the educators, and buying medical care for an aging population. Despite being the source of new technologies and national price, NASA seems to be in a death spiral. From that high point of 5.5% of federal revenues, NASA was down to .58% in 2007. Current spending on our space program is roughly equal to what was spent in 1960. To put that in perspective, the cost of social security was 30 times greater than NASA’s costs in 2007. Social programs, although well-meaning, have ruined certain segments of American society, and turned the greatest generation into the “gimme” generation. No outlay of funds is sufficient to provide the poor with what they want. Only work can do that; but with a sputtering economy and a no confidence vote from business, there are fewer and fewer jobs. Elected officials tend to vote to please the electorate which put them into office, and government paychecks trump rockets. With the space shuttles decorating museums, what will happen to the satellites that provide us with spying capabilities, gps navigation, and Entertainment Tonight? As long as the satellites remain functional, we won’t know the difference. But, with no means of launching new satellites, we will be like Cuba. In Castro’s country, streets are dotted with fifty year old America autos, because there are no new ones coming into the country. After NASA, our satellites will be just like those ancient autos. Maybe my children will see the first Martian colonists. Or maybe, they won’t see anything, because the satellites will have fallen from the sky.